Now that Sherry has become cool what is the modern anachronist supposed to drink? My tip is to search out the fortified wines of Southern France. There’s no Vin Doux Naturel equivalent of the powerful Sherry lobby so I think it’s going to be a long time before the moustache-brigade catch up with these wines. 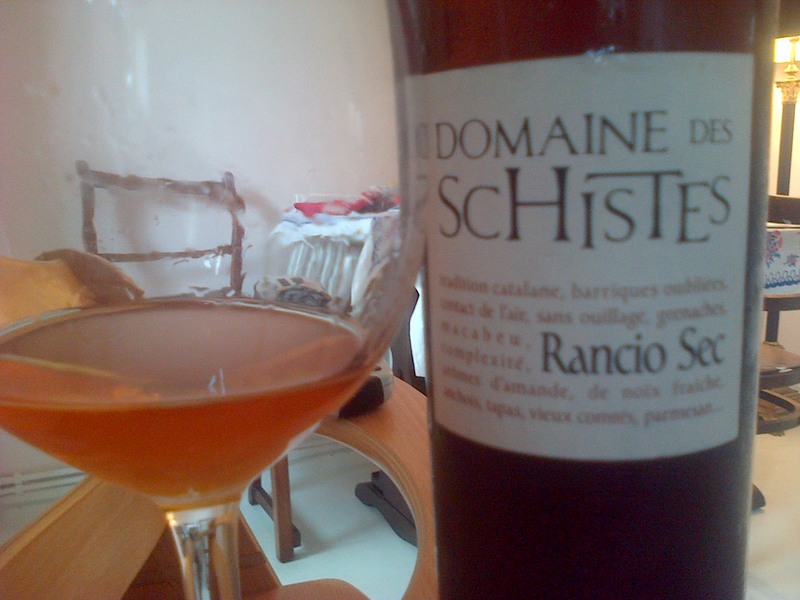 The one I want to write about, Domaine des Schistes Rancio Sec, isn’t even available in Britain. It does seem slightly silly to write about something that can’t be bought here but as I liked it so much it would be even sillier not to write about it in some detail. I bought it whilst on holiday in Ceret in the foothills of the Pyrenees. The region is famous for its fortified wines, the best known being the sweet reds of Maury and Banyuls. This is Catalan country and across the border in Spain the traditional wines are also fortified reds. Apparently this has something to do with the ground being too hard to tunnel into so there was no way of keeping wines cool, consequently they had to withstand the summer heat. Now on both sides of the border the old vines that went into the traditional styles are now making superb table wines. But it’s worth seeking out the classic style which is known by the Spanish name, Rancio. Sounds appealing, doesn’t it? In order to become Rancio, you have to do the opposite of everything you’re taught about modern wine. You don’t keep it cool, you don’t protect it from oxygen and you age it for a long time. Barriques oubliees! How could you not love a wine that was matured in ‘Barrique oubliees’? It wasn’t particularly expensive, 15 euros for 50cl. So how does it taste? Well more to the point how doesn’t it taste? There’s so much here and it changes from minute to minute and from day to day. Some sips it seems sweet and some raspingly sour like an old Amontillado. It’s a blend of Macabeu and Grenache Blanc/ Gris. It’s an orange/ brown colour. It smells of caramel and floral too. There’s all kinds of wonderful flavours, chestnuts, dried apricots, vanilla. What I loved most about it was its freshness and acidity – it’s actually extremely refreshing. It’s been open a week now and just gets better and better. It went particularly well with Comte and Stilton. The closet comparisons would be a dry Madeira or perhaps a really good Marsala though my wife said it reminded her a little of a Moscatel de Setubal. 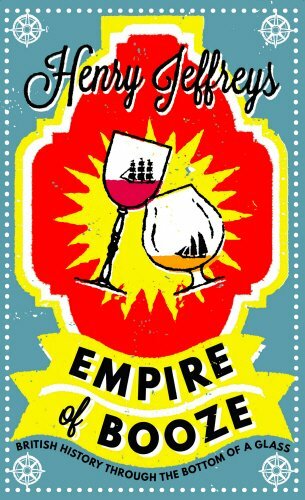 It’s interesting that these comparison wines owe their fame to the British Empire and their flavour to long sea voyages whereas the French equivalents just stayed at home, soaked up the sun and developed their unique taste. The fortified wines loved by the British became global whereas the French equivalents stayed rooted in their region drunk only by the French and the occasional Dutchman. I’m so pleased that someone is out there making wines like this. It’s a wine that requires patience and time. It’s expensive to make. I doubt it makes the Domaine much money but it’s the best thing I’ve had all year and I want some more. Will someone please start importing it? This entry was posted in Wine articles, Wine of the week and tagged British Empire, Domaine, Fortified wine, French wine, Oak (wine), Port wine, Pyrenees, Rancio, Sherry, Wine. Bookmark the permalink. Will you please start importing it? Forget everything else. Sherry has been co-opted by the pretentious, the hip, and the young. And I still think Madeira is for old biddies. When I’m an aged woman oubliee, I will only drink from les barriques oubliees. Rancio is king! It sounds divine, I’m thirsty now. If you import it, you’ve found your first customer.